Listen: You Can Hear The Northern Lights, Researchers Say : The Two-Way There have been folktales for centuries about sounds supposedly coming from the sky when an aurora borealis is lighting up the night. Now, scientists in Finland say they've recorded the noises. What they don't know yet, is what causes them. 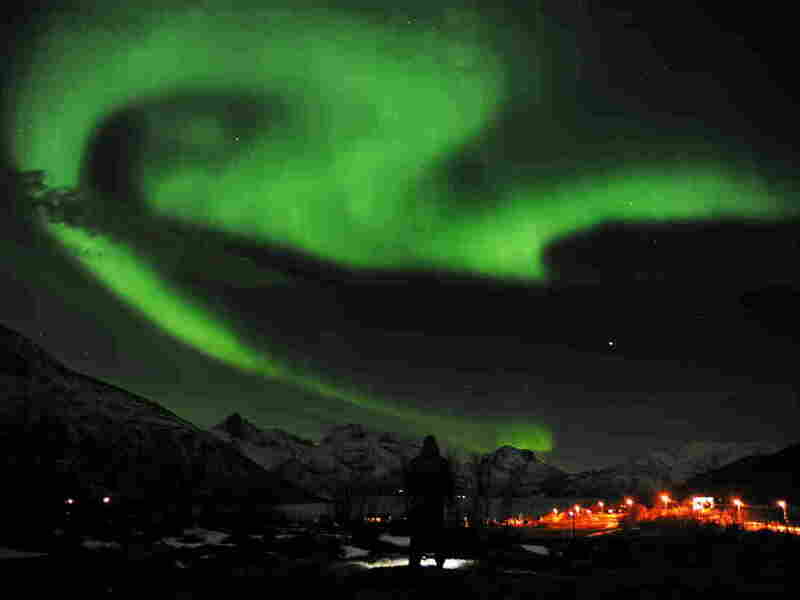 The northern lights over Tromsoe, northern Norway, on Jan. 24, 2012. It sounds to us like someone's banging on a pipe. Others think it's like a clap. The northern lights do make noises that can be heard down on the ground. There's video — with sound — supporting their case. What the researchers still haven't figured out, they concede, is "how the auroral sounds are created." "The recorded, unamplified sounds can be similar to crackles or muffled bangs which last for only a short period of time. Other people who have heard the auroral sounds have described them as distant noise and sputter. "Because of these different descriptions, researchers suspect that there are several mechanisms behind the formation of these auroral sounds. These sounds are so soft that one has to listen very carefully to hear them and to distinguish them from the ambient noise." This gives us a reason to repost some amazing video from Minnesota (there's no sound on this one).